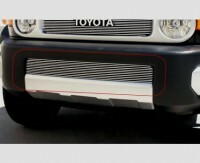 T65456A: 07-14 Toyota FJ Cruiser Bumper Billet Grille. This polished bumper billet grille bolts directly into the bumper opening and comes with installation instructions and hardware. This is the bumper billet grille only. Backed by manufacturers one year warranty. Imported. Tell your friends about the Bumper Billet Grille. Share this product on Facebook, Twitter, MySpace or send an email to a friend!